Spring Stars in the Northern Hemisphere. Spring is just around the corner and when the winter constellations begin to make their exits to the west, we will find Boötes, Leo, Cancer, Hydra and Virgo lurking in the wings ready to take their places. They will soon join the ever-present circumpolar constellations of Ursa Major and Minor, Cassiopeia, Perseus and Auriga. in the northern hemisphere’s night sky. Leo, The Lion. Leo is one of the largest constellations in the sky and is visible throughout the Northern Hemisphere during the spring months and in the northern regions of the southern hemisphere during the summer and autumn months. 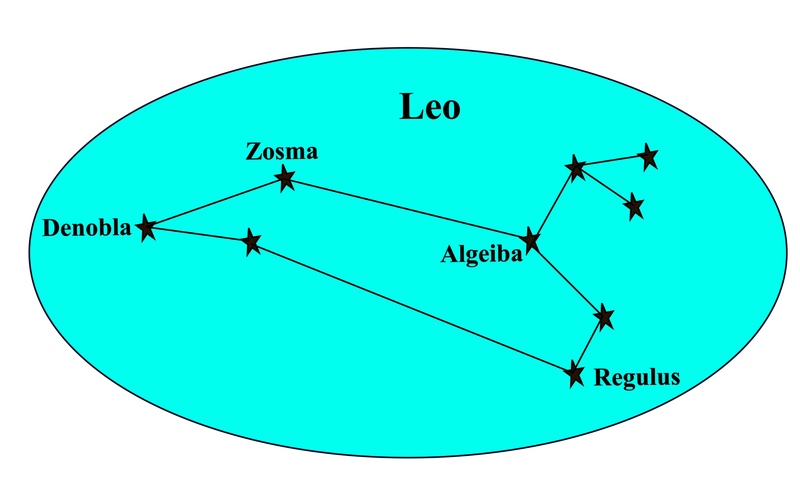 Leo is home to two navigational stars, Denobola and Regulus which are shown in the diagram above. Regulus, the brightest star in the constellation, is said to mark the lion’s heart with Denobola marking the tip of its tail. From a navigation perspective, these stars are best seen for star sights during evening nautical twilight during the month of April. The name Leo means Lion in Latin and the constellation, which is depicted as a crouching lion, is associated in Greek mythology with the lion of Nemea which was killed by Heracles as one of his twelve labours. How to find Leo. 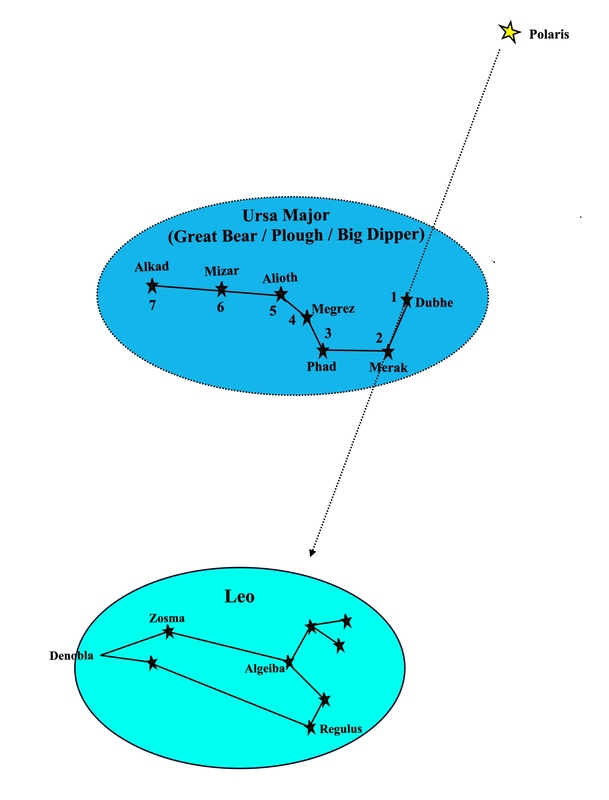 When the line of pointers in Ursa Major is produced in the opposite direction to the Pole Star, that is from Dubhe to Merak, it will point to Leo as shown in the diagram below. Boötes The Herdsman. If we take a line from Alioth to Alkaid in the Great Bear and extend that line in an imaginary curve for about roughly three hand-spans as shown in the diagram below, it will point to Arcturus, the brightest star in the constellation Boötes. Boötes, the 13th largest constellation in the sky, is located in the northern hemisphere and can be seen from 90oN to 50oS. The ancient Greeks visualized it as a herdsman chasing Ursa Major round the North Pole and its name is derived from the Greek for “Herdsman”. Arcturus, the brightest star in Boötes, is the fourth brightest star in the sky and is a navigational star which, for navigators, is best seen during morning and evening nautical twilight during April and May. The ancient Greeks named Arcturus the “Bear Watcher” because it seems to be looking at the Great Bear (Ursa Major). Corona Borealis The Northern Crown. If we next take a line from Nekkar to Princepes in Boötes, and extend that line by about one and a half hand-spans, it will point to Nusakan in the close by Corona Borealis constellation. Corona Borealis, whose name in Latin means ‘northern crown’, is a small constellation in the northern hemisphere and can be seen between latitudes 90oN and 50oS. Alphecca, the brightest star in the group, is a navigational star and is best seen for star sights during morning and evening nautical twilight in April and May. The main stars in Corona Borealis form a semi-circle which is associated with the crown of Ariadne in Greek mythology. It is said that the crown was given by Dionysus to Ariadne on their wedding day and after the wedding, he threw it into the sky where the jewels became stars which were formed into a constellation in the shape of a crown. Virgo, the Virgin. Virgo lies over the southern hemisphere and is one of the largest constellations in the sky; it is visible between latitudes 80oN and 80oS. The brightest star in Virgo is Spica, the 15th brightest star in the sky and a very important navigational star which can be seen during morning nautical twilight from December through to May and during evening nautical twilight from April through to September. 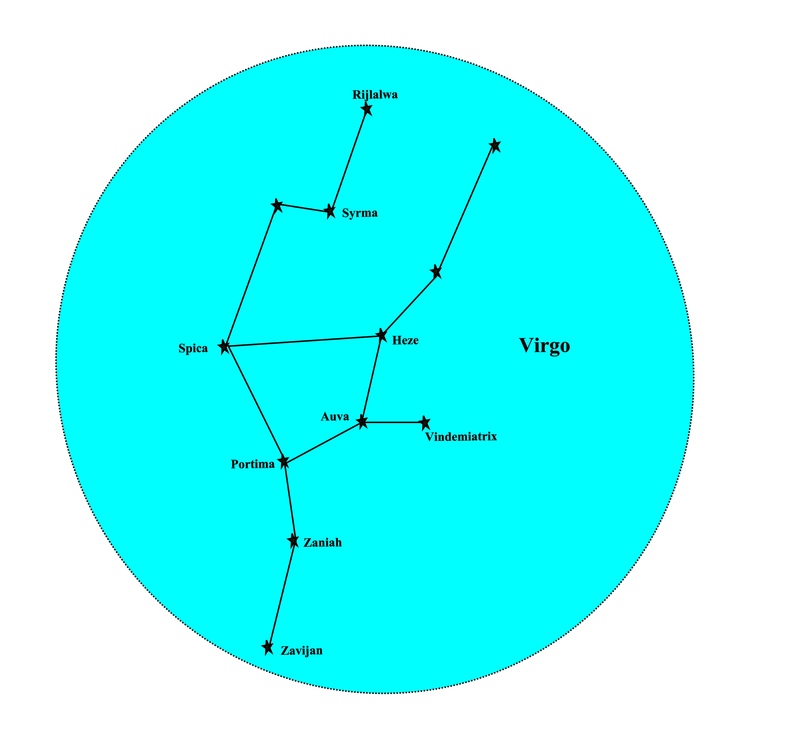 In ancient Greek mythology, Virgo is associated with the goddess Dike, the goddess of justice and the constellation Virgo takes its name from the Latin for virgin or young maiden. Finding Virgo. 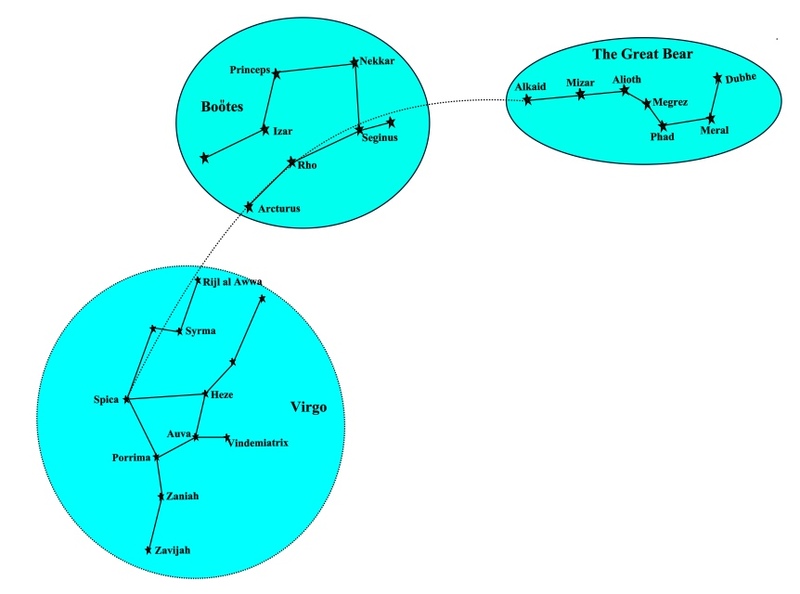 As we learned when studying the constellation Boötes, an imaginary curved line from Alkaid in the Great Bear leads to the bright orange star Arcturus, in the constellation Boötes. If, as shown in the following diagram, we continue that curved line by another hand span from Arcturus we will come to the bright bluish-white star Spica in the constellation Virgo. Hydra, the sea serpent. The constellation Hydra, the sea serpent, is the largest constellation in the night sky and it is also one of the longest constellations. 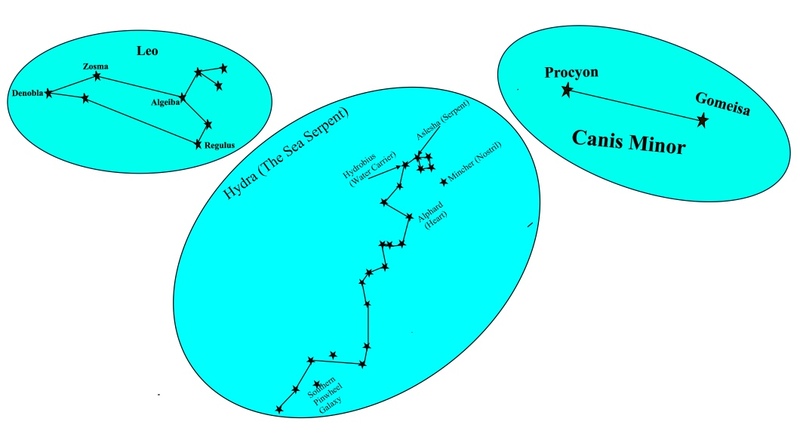 Hydra’s head is located south of the constellation Cancer and its tail lies between Centaurus and Libra. It is best seen from the southern hemisphere, but can be observed in the northern hemisphere between January and May. Hydra contains one navigational star and that is Alphard which, for star sights, is best observed during evening nautical twilight during February, March and May. In Greek mythology, Hydra represents the water snake brought to the god Apollo by the crow Corvus as an excuse for being late from his errand to fetch water. It may also represent the hydra from the myth of Hercules and his twelve labours. The Hydra was a giant beast with the body of a dog and 100 snake-like heads. It was slain by Hercules on the second of his twelve labours for the king of Mycenae. As each head was cut off, two more would grow in its place. Hercules burned the roots of the heads to prevent them from growing back. Finding Hydra. 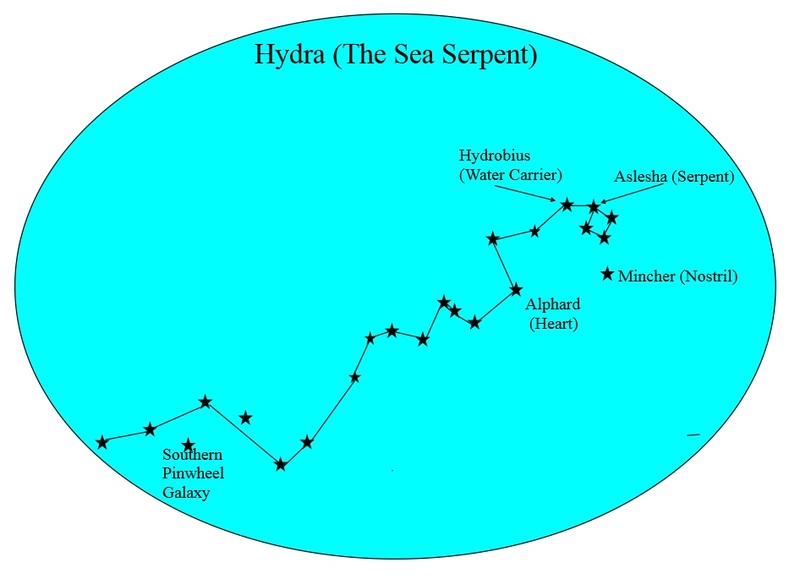 Hydra is such a large constellation that it really depends on which part of it you want to see. If you want to see head, then, as the diagram below shows, you should look between the constellations Canis Minor and Leo (look for the bright stars Procyon in Canis Minor and Regulus in Leo). If you the tail, then you should look to the south of Virgo (look for the bright star Spica). Cancer The Crab. 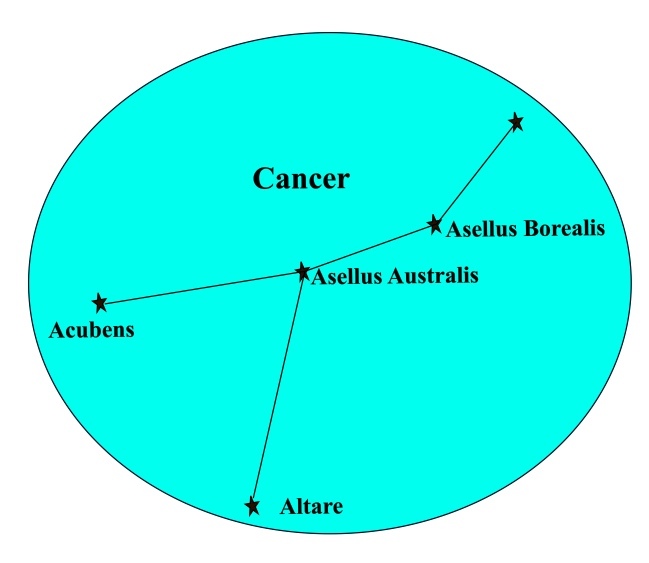 Cancer is a relatively small constellation in the northern hemisphere and is visible between latitudes 90oN and 60oS. Cancer consists of mainly faint stars, none of which is a navigational star and for this reason, it is not a very useful constellation for astro navigation. However, it does help us in one way: Although astrology has no place in astro navigation, the signs of the zodiac can be very useful to navigators because the order in which they follow one another can tell us the position of one zodiac constellation in the sky with respect to another. For example, we know that Cancer’s position on the ecliptic falls between Leo and Gemini and as the following diagram demonstrates, Cancer can easily be found nestling between those constellations with Gemini lying to the west and Leo to the east (remember that in star maps, east and west are reversed with respect to conventional maps). From this, it can be seen that Cancer can be an aid to locating both Gemini and Leo. The Tropic of Cancer. These days, the Sun passes through Cancer in late July; however, in the time of Ptolemy, around 2000 years ago, this occurred during the summer solstice when the Sun reached 23.4o N, the northern limit of the ecliptic. The latitude 23.4o N is still called the Tropic of Cancer even though the Sun now resides in Taurus at the summer solstice. In Greek mythology, Cancer is associated with the crab in the story of the Twelve Labours of Heracles. The goddess Hera sent the crab to attack Heracles while he was fighting the Lernaean Hydra but Heracles kicked it all the way to the stars where it formed the constellation Cancer. In another version of the story, Hera placed the crab in the sky in gratitude for its efforts even though it was killed by Heracles. (Heracles is the Roman name for the Greek god Hercules). This entry was posted in astro navigation, celestial navigation, Marine Navigation, navigation and tagged astro navigation, astronomy, celestial navigation, mathematics of astro navigation. Bookmark the permalink.